I’m describing the two series as parallel. Book #1 of either series serves as an ideal starting spot. Knowledge of one series is not required to enjoy the other, but reading both will provide a fuller understanding. And if that hasn’t made your blood boil, I’ll soon be publishing season one of The Green Ones (a dystopian serial) which will weave it’s way back and forth through both of the other series. The Green Ones will also serve as on on ramp capable of being enjoyed in isolation from the rest of the DMB universe. Mine is a truly dizzying intellect. (Or so they say.) I can’t help it. Before I know what has happened, I discover a new angle into the universe of my own creating (and named thusly) and follow it into a new series of books. 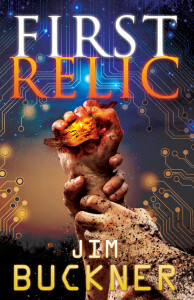 If you’re ready to plunge deeper down the rabbit hole, check out First Relic at Kobo Books, or Barnes and Noble, or click on the image below for Amazon. And as always, enjoy the show! Yup. Eight. It’s been three years since I started writing full-time. During the first year I worked exclusively on my first book, Fistful of Reefer. The next year I hammered out The Austin Job, Twitch and Die! and a compilation of Lost DMB File shorts. Over the last twelve months, I’ve written De Novo Syndrome, Desert Gods, The Green Ones: Season One, and now I’m polishing up First Relic. And you know what? I’m starting to learn the ropes as a professional writer. The much awaited continuation of the DMB Files has arrived! (Hey, me and at least 4 other people have been really awaiting it.) DESERT GODS (not to be confused with DESSERT GODS. That’s a whole different book entirely.) picks up where De Novo Syndrome leaves off and throws Buckner and Evie into a final showdown with Oleg and his minions of twitchers. But, before they get to the desert they pick up my new favorite character, Dr. Petrosian. The crank of all cranks, this guy makes Buckner look downright cheery. Plus, he is keeping all kinds of secrets from when he used to be Buckner’s father’s partner and best friend. Anywho, this book reveals all sorts of gems on Buckner’s past as well as some revelations about the nature of the twitch retrovirus. On top of that, I drop a bit of a bomb that will reinterpret the way Buckner sees his entire world. Ooolala. You sci-fi and twisty thriller fans won’t want to miss it. Expect the unexpected! 1.) Go buy it! 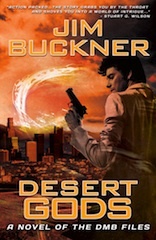 DESERT GODS is available from Amazon and Kobo Books and B&N. 2.) If you have read the book, please post a review on Amazon and Goodreads. DE NOVO SYNDROME will be on sale for $0.99 May 1st-3rd!!! Available at Amazon, Barnes and Noble and Kobo Books. If you still need to pick up a copy of De Novo, I recommend taking advantage of the sale. If you insist on paying the full $2.99, just pick it up now, or wait until May 4th! The sale is for ebooks only, but De Novo is available in paperback as well, from Amazon. Finally, you can always spread the word to anyone else you think would be a fan. Above all, enjoy the show!